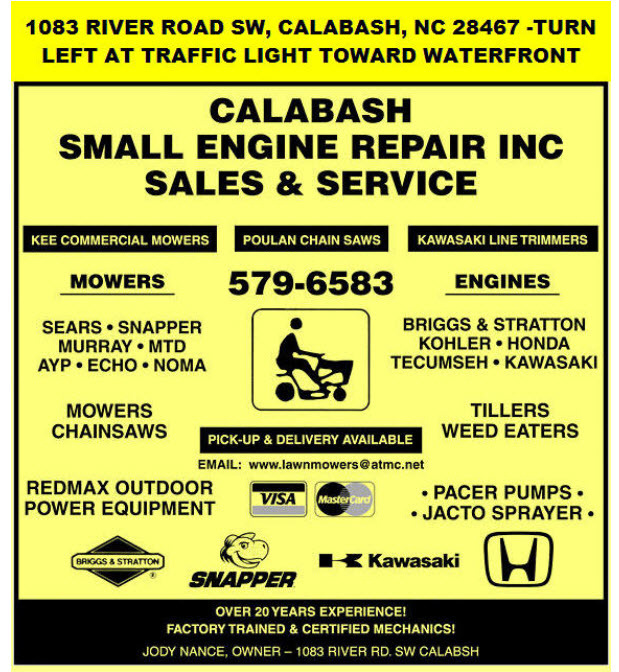 Calabash Small Engine Repair Inc.
Now is the time to bring your mower in for service before we get really busy. Mowing tip!! mow yard lower when we've had good rain and a bit higher when the weather is dry and the yard is crying for water. Service tip ! your air filter is the most important part of your mower to keep clean other than making sure it full of oil each time you start your engine. mowing creates a lot of dust even if you have nice grass and can get dirty quicker than you think. removing filter is easy and bring it by the shop and we can match you up with a new one. Come to traffic light in Calabash that goes to the Historic waterfront turn onto that road go approx. 500 yards. Business be located on the left turn into access road follow to rear of the property. Contact 910-579-6583 for more information and directions Thanks Jody and Barbara Nance we look forward to seeing you.